The means to enjoy the full value of Vedic Agriculture is to develop Vedic Consciousness, Transcendental Consciousness, through Maharishi's Transcendental Meditation. In 1957 His Holiness Maharishi Mahesh Yogi began to offer to the world the quintessence of the most holistic tradition of knowledge on earth—the Vedic Tradition. In that year he introduced the simple, natural, and universal technique of Transcendental Meditation. This extraordinary technique has been used by sages both ancient and modern to directly experience and utilize the field of Pure Being—the transcendental field of consciousness at the source of thought. The experience of Transcendental Consciousness develops the individual's latent creative potential, while dissolving accumulated stress and fatigue through the deep rest gained during the practice. This experience enlivens within one's awareness profound peace and happiness, creativity, dynamism, orderliness, and organizing power, which results in increasing fulfilment and success in daily life. The Transcendental Meditation Programme is the most direct way for the fulfilment of the supreme philosophy of life, where the individual lives life in full enlightenment and breathes life in Cosmic Reality. 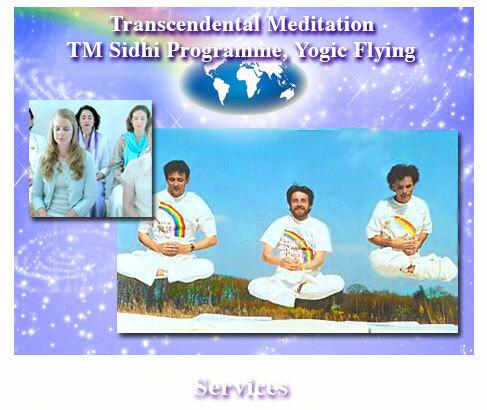 The TM-Sidhi Programme is an advanced aspect of Transcendental Meditation. It trains the individual to think and act from the level of Transcendental Consciousness, greatly enhancing the coordination between mind and body, and developing the ability to enliven Natural Law to support all avenues of life to fulfil one's desires. ‘Yogic Flying demonstrates perfect mind-body coordination and is correlated with maximum brain wave coherence (EEG), indicating maximum orderliness and integration of brain functioning. 'Even in the first stage of Yogic Flying, where the body lifts up in a series of short hops, this practice gives the experience of bubbling bliss for the individual, and generates coherence, positivity, and harmony for the environment. More than 600 scientific studies, conducted at over 200 independent research institutions in 30 countries, objectively document the benefits of Maharishi’s Transcendental Meditation and TM-Sidhi Programme, and prove their profound benefit to all aspects of individual life and the life of society. Refer to Scientific Research on Maharishi’s Transcendental Meditation Programme: Collected Papers, Volumes 1–5, MUM Press [over 5,000 pages; Volumes 6–7 are in press]. Maharishi's Transcendental Meditation Technique must be learned from a qualified teacher of the Transcendental Meditation Programme. The technique cannot be learned from a book, video or audio tape. For information on where to learn Maharishi's Transcendental Meditation in countries not listed below, please submit a request to www.tm.org/contact-us or call (USA): +1-888-LEARN TM (+1-888-532-7686). The following list represents only those countries which have established a website for promoting Maharishi's Transcendental Meditation in their country, although Transcendental Meditation is actually taught in over ninety countries in the world.